Jen Wittman on thyroid brain fog and the effects of blue light. 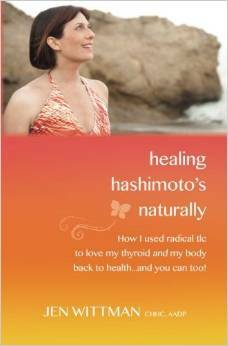 Attention thyroid sufferers. Special on aisle 12: brain fog. Blue Light Special. It’s one of the symptoms my community mentions the most when it comes to the most annoying and disruptive symptoms of thyroid disease. Combine it with insomnia, as the disorder so often does, and you’ve got a recipe for total brain white-out conditions. Zero visibility. Of course, the best way to get rid of brain fog for good, are to heal the underlying causes, and these causes can be different from person to person, including food intolerance, dehydration, hormone imbalances, and more. But healing takes time, and in the mean time we’ve still got to get on with our lives! So when I heard that something as simple as switching your light bulbs could have a positive effect, I had to check it out. Studies have shown that exposure to blue light increased people’s reaction time, alertness, and attention span. Even blind people have been shown to receive benefits from blue light in one super cool study! So, break out the colored bulbs! I’m betting I’m not the only one for whom that would be an amazing improvement! Interestingly, in another study, scientists compared the effects of caffeine and blue light on brain function. In simple tasks, the effects were the same, but in tasks that required “executive function” (in other words: actual brain power), caffeine actually had a negative effect, while blue light had a positive effect. One more reason to give up your coffee habit if you haven’t already! How to bring the magic blue fairy into your life and banish brain fog. Look for a blue LED bulb—the studies were done with LEDs. You should be able to find them at the hardware store. And don’t be surprised if they don’t look blue in the package; the effect can be subtle. They’re also sometimes sold as grow lights for plants. Or, get blue light for free—outside. Natural sunlight has a blue cast, so just getting outside into nature for a few minutes a day can help a lot. Or, download an app—there are blue light apps for your phone now, too. If you work at a computer—you may not see as much of a benefit, because you’re actually already getting a dose of blue light from your LED screen! It doesn’t have to take long—research shows that as little as 50 seconds of exposure has benefits. What do you think? Will you try blue light as a remedy for brain fog? Is it an inexpensive quick fix, or a whole lotta hooey? Let me know! Jen Wittman, CHHC, AADP is a Holistic Health Care Expert and compassionate thyroid/autoimmune coach providing one-of-a-kind, long-lasting healing programs with a heaping dose of joy and humor. Jen has degrees in culinary arts, psychology, transformational coaching, nutrition, and Italian. She spent a year honing her cooking skills in Italy and is passionate about physical rejuvenation, family, laughter and helping people craft the life of their dreams. Support one of our own, Thyroid Thrivers and read her story. Questions or anything to ask Jen about blue light? We want your thoughts in the comments section–Please!